[DragonQuest] Did DragonQuest have a setting? I recently learned about a RPG called DragonQuest (not to be confused with the boardgame called Dragon Quest, which is apparantly set in Thunder Rift). According to RPG.Net's DragonQuest article, this RPG was originally published by SPI and then taken over by TSR. RPG.net's article has a View DragonQuest - Setting Info link, but the page just says "There is no info on DragonQuest. [ Add It! ]". But back to where I cane in. One of my friends told me they had just found DQ1 The Shattered Statue. It looks like that might have been some sort of attempt to convert DragonQuest over into AD&D (like they tried with Mystara). One thing that confuses me is that the Amazon.com page suggests the adventure can be used with Forgotten Realms (rather than AD&D). So what I am wondering is: was there a campaign setting for DragonQuest and did TSR fold that campaign setting into an area of the planet Toril? Re: [DragonQuest] Did DragonQuest have a setting? Yes! It was called "Frontiers of Alusia", and it was not at all too shabby! The modules, IIRC, are not set within the area covered on the map, though. How many products were released for DragonQuest (Not counting the boardgame and its associated products)? Big Mac wrote: It looks like that might have been some sort of attempt to convert DragonQuest over into AD&D (like they tried with Mystara). One thing that confuses me is that the Amazon.com page suggests the adventure can be used with Forgotten Realms (rather than AD&D). So what I am wondering is: was there a campaign setting for DragonQuest and did TSR fold that campaign setting into an area of the planet Toril? The adventure is set in the Realms and works as a dual system module if I remember correctly. It has some interesting elements, such as the runesticks, but it is a bit out of place with the "canon" Realms. But then again, so do a lot from the Savage Frontier which I have heard incorporated a lot from The Enchanted Wood (I don't own that module, as it is a bit to expensive to get just to check). I seem to have heard Janelle Jaquays mention (on Save or Die) that she had absolutely no knowledge of the Dragonquest rules when she wrote for the setting, so Ad&d might have played a bit in the background anyway. Ahhhh What a great game! (at least from memory). I played a few sessions when it came out in the 80s. It was very different. No classes, used 100% and skills instead. But our group voted to go back to D&D after a few trial games. We never saw that DM after that... he preferred DQ. Le Noir Faineant wrote: Yes! It was called "Frontiers of Alusia", and it was not at all too shabby! The situation with DQ1 The Shattered Statue is looking more complicated. 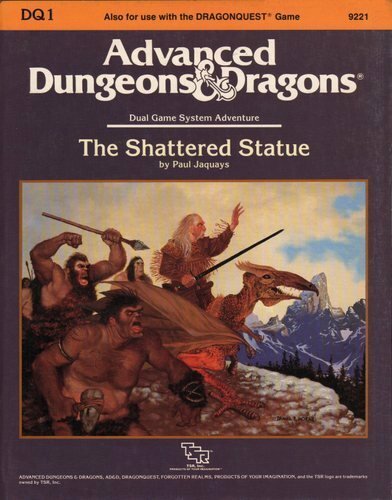 According to The Acaeum, The Shattered Statue was originally supposed to be a conversion (to AD&D?) of The Enchanted Wood, but then TSR asked Jennell Jaquays to turn it into something else. After that, Jennell apparantly kept some of the characters from the original adventure and moved it to Forgotten Realms. So it does look that some elements of the Savage Frontier area are raided from the Frontiers of Alusia. But I'm not sure the entire setting was absorbed. Technically TSR owned "Frontiers of Alusia", so they were entitled to raid it for FR ideas, but I'm trying to work out what is going on here. Would it be worth buying "Frontiers of Alusia" adventures to run them in the Savage Frontier? Bah! Why couldn't I get that lot to come up when I searched. Do you know if all of those products used the "Frontiers of Alusia" setting or if Judges Guild did something like use the DQ rules with their own Wilderlands setting? The Rules of Lia: DragonQuest - A page with lots of DragonQuest links on it. The Rules of Lia page for DragonQuest could be useful if we ever want to have an "Other DragonQuest Links" sticky at The Piazza, but the first one is great for seeing the product line (it is pretty much what Boneguard posted, but with pretty pictures of the covers). Sorting things into order, it seems that SPI created DragonQuest in 1980, updated it to 2nd Edition in 1981, licensed it to Judges Guild in 1982 and then the franchise sat dormant until 1987 (when DQ1 The Shattered Statue was published) and tailed off in 1989 with TSR's 3rd Edition. I know that SPI used "Frontiers of Alusia". The map didn't come out until 1981, so I'm not sure if the 1980 products were retconned into "Frontiers of Alusia". I also know that DQ1 The Shattered Statue did not use "Frontiers of Alusia". The descriptions from Wayne's Books for two of the three Judges Guild products mention "Frontiers of Alusia". I'm guessing they probably created their products in unused areas of the map. So the biggest mystery is the 3rd Edition DragonQuest (from TSR). Did that stick with Forgotten Realms or return to "Frontiers of Alusia"? And did TSR ever give any guildlines for retconning DQ1 The Shattered Statue back into the DragonQuest campaign setting? Havard wrote: How many products were released for DragonQuest (Not counting the boardgame and its associated products)? There also seems to be a third game (a video game called Dragon Quest) which I think is not related to either of the other games. It is one of the reasons I was having problems looking for information on this. The search results are flooded with false-positives. I picked up the 3rd edition of thebook a couple weeks ago. I've only browsed through it but it's definitely a unique system for the times it was published in. There isn't hardly any setting to the book. Only what is in the adventure at the end of the book. Knightfall wrote: I picked up the 3rd edition of thebook a couple weeks ago. I've only browsed through it but it's definitely a unique system for the times it was published in. There isn't hardly any setting to the book. Only what is in the adventure at the end of the book. Thanks for that. It's good to know. William A. Barton reviewed Frontiers of Alusia in The Space Gamer No. 42. Barton commented that "Frontiers of Alusia looks to be a handy playing aid for nearly any FRPG and should prove particularly useful to DragonQuest players looking for a setting for their campaign." ...What I just stumbled upon is the default setting: the Frontiers of Alusia. And I must say that I'm digging it. You get an ~125,000 sm setting, with lots of geographic detail but virtually no settlements. A small barony on the coast and a smaller fief inland. It's not very medieval in that way; rather, it seems to be channeling the idea of the American frontier: people move from the civilized North into the frontiers in search of whatever they are in search of. You kinda know what's there, but not really. Things have names on the maps, but no one has really ever explored them. Plus, the entire gazetteer is 4 pages long. That's it. For someone like me, that's gold! The content of this accessory speaks almost of itself. The Alusia Border Guide (4 pages) describes in 3 columns and in one paragraph the different specific places of the map by indicating the type of terrain, the level of danger, the frequency and the chances of making a meeting, as well as a modifier for the dating table. Follows a description of the place of some lines. The big map is that of the border area of ​​Alusia. An excerpt can be seen on the cover of the book. The hexagonal checkerboard is numbered on the edges of the card. The legend of the map is on the back of the cover. In the interior shutters, we discover an introduction to the book, how to use this accessory, what must be visible or not to the players on the map and an explanation on the use of the table of dangers present on the 3rd cover. Finally a last section describes on a little more than one column the global region.